Oscar Pistorius was praying over the body of his girlfriend Reeva Steenkamp as she lay dying, the Paralympic champion’s neighbor Dr. Johan Stipp told his murder trial today. In the trial’s first account of the moments after the shooting, Johan Stipp said he tried to revive Reeva Steenkamp. During Dr. Johan Stipp’s testimony, Oscar Pistorius cried and seemed to retch. The double amputee denies intentionally killing her, saying he mistook Reeva Steenkamp, 29, for an intruder. 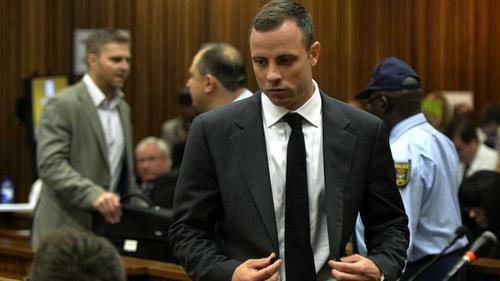 If found guilty, 27-year-old Oscar Pistorius could face life imprisonment. Dr. Johan Stipp, who was testifying on the fourth day of the trial at the high court in Pretoria, said he could see Reeva Steenkamp’s brain tissue in her hair. It was at this point in the testimony that a police officer passed a plastic bag to Oscar Pistorius. Recalling the early hours of Valentine’s Day 2013, Dr, Johan Stipp said he had heard gunshots and after making sure it was safe, went to help. When he got to Oscar Pistorius’ house, he found the athlete kneeling by Reeva Steenkamp, with “his left hand on her right groin, and his right hand – the second and third fingers – in her mouth”. “Oscar was crying all the time,” Dr. Johan Stipp said. Dr. Johan Stipp said Oscar Pistorius had been in an emotional state, and fearing he might hurt himself, had asked where the gun was.